In Minnesota, an infant, too young to be immunized, was hospitalized with measles. According to a story in the Minneapolis StarTribune, the child most likely was exposed while the family was in the Chicago area. Because of the nature of the measles virus, he or she was probably contagious from around February 22 to March 2. Since we don't know exactly how the baby was exposed, we can't state for certain whether the infected individual that passed it on was vaccinated or not. We can say, though, that this case illustrates how important it is to vaccinate those who can be vaccinated. This infant was too young to receive the immunization and had to rely on everyone else for protection, to rely on herd immunity. 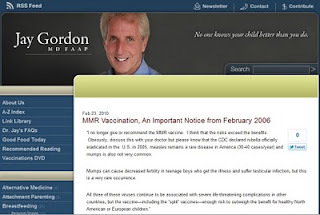 Now, most responsible health providers would advocate that those who can get the measles-mumps-rubella vaccine should get it, because, as illustrated by the Boston outbreak and the New Mexico woman who flew from London to Denver to New Mexico (where she was diagnosed), passing through four U.S. airports, a simple declaration that measles is not endemic to the U.S. is no guarantee that an individual will not be exposed. Dr. Jay Gordon, however, is not among those responsible health providers, in my opinion. Who is Dr. Gordon? He is a California pediatrician, serving such celebrity children as Jenny McCarthy's son. He shows up on a lot of skeptic blogs, complaining about "incivility", acting the apologist for the anti-vaccine movement and almost never backing up anything he claims with any valid evidence, except for his "30+ years of clinical practice" (with no controls or anything to minimize bias or confounders, of course). Yep, he claims that immunity wanes (an exceedingly rare occurrence) and that good health can stop the spread of the disease (no evidence offered for that). I and others have asked him for evidence for his claims that the vaccine is riskier than the disease, but to no avail. All he has is his opinion. And an ill-informed one at that. His behavior, his recommending that people not receive the MMR, puts not only the patient at risk of infection, but also puts people, like the Minnesota infant, at risk of contracting an illness that has a 1-2 in 1,000 risk of death. In case I haven't made my point yet, let's take a look at measles. It is contagious. Really, really contagious. The virus is spread via the air and can survive for 2 hours after an infected person has left the room. Approximately 90% of susceptible people that come in contact with someone that is infected will contract measles, and they will be contagious from around 4 days before a rash appears to about 4 days after it appears. So, if infected person A comes in contact with 100 susceptible people (e.g., those who have never been infected or immunized), we can expect about 90 new cases; it can spread very fast. It may seem like a common cold at first, with symptoms including cough, runny nose, mild to moderate fever, red eyes and a sore throat. About 30% of cases will have some manner of complication, ranging from ear infection (1 in 10, possibly resulting in permanent hearing loss) to pneumonia (1 in 20) to encephalitis (1 in 1,000) to death (1-2 in 1,000). Those are numbers for healthy children who are infected. Women who contract it while pregnant risk miscarriage, premature delivery or low birth weight babies. The American Academy of Pediatrics recommends MMR immunization (PDF). That's the same AAP of which Dr. Gordon is a fellow (the FAAP that he's fond of proclaiming after his name). Okay, I think I've ranted enough. The majority of people are rational, reasonable people who understand the value of vaccines. Thankfully, in the U.S., vaccination rates are high, which means that, hopefully, the outbreak in Boston won't expand and the New Mexico and Minnesota cases won't spread. It is incumbent upon all of us to do what we can to protect each other. 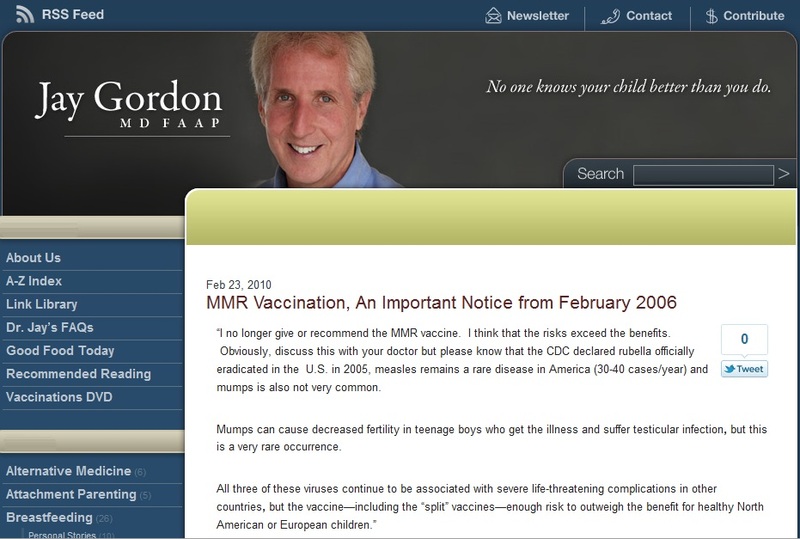 Vaccination with the MMR is a safe, effective means of doing this, and, in my opinion, any person that actively spreads misinformation, fear, doubt and uncertainty without valid evidence to support their claims is not only irresponsible, but a danger to all, especially when that person is a pediatrician who should know better. Note: This post is my opinion. If I have made any errors in fact, please let me know and, if I am indeed wrong, I will correct them. The thing that worries me about measles is that it can very well be a sentinel event for worse things. Sure, the probability of smallpox coming back is incredibly small... But it and other things behave the same. That is, you don't have to be there to be infectious to other people. You can leave the virus on stuff to infect others. Of course, some will call me a fearmonger. So be it... But I would not be doing my job if I wasn't listening for zebras. Yep. What's really scary is that with something like measles, the infected person doesn't need to cough or sneeze. They just need to exhale. And wherever they go, they leave a nice, lingering trail of virus for others to inhale and become infected. Scary how easily it can spread.